Xcode6 has removed the Empty Application template when creating a new project. 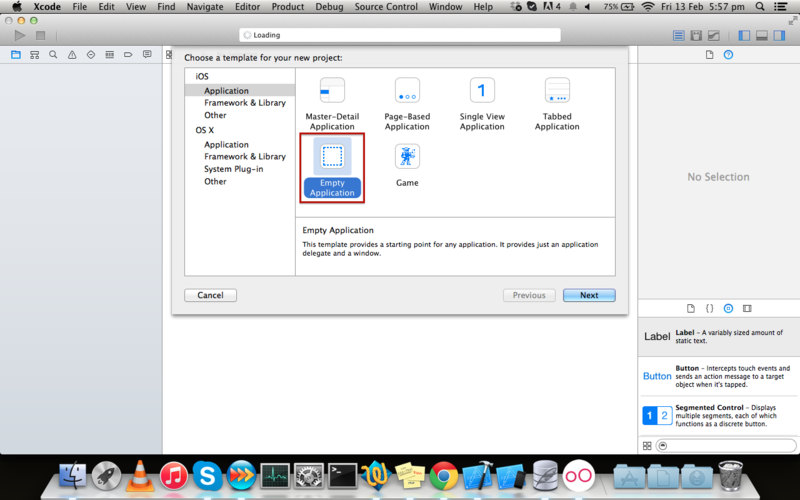 How can we create an empty application (without Storyboard) in Xcode6 and above, like in earlier versions? Create a Single View Application. Remove Main.storyboard and LaunchScreen.xib (select them, right-click, and choose to either remove them from the project, or delete them completely). Remove "Main storyboard file base name" and "Launch screen interface file base name" entries in Info.plist file. A simple approach would be to copy the XCode 5's Empty Application template to XCode's templates directory. You can download XCode 5's Empty Application template from here, then unzip it and copy to /Applications/Xcode.app/Contents/Developer/Platforms/iPhoneOS.platform/Developer/Library/Xcode/Templates/Project Templates/iOS/Application directory. P.S this approach works with swift as well! As suggested by @harrisg in a comment below, You can place the above mentioned template in ~/Library/Developer/Xcode/Templates/Project Templates/iOS/Application/ folder so that it may be available even if Xcode gets updated. To add a default launch image, otherwise the app size will be 320x480 on iPhone 5. #warning "This project uses features only available in iOS SDK 3.0 and later." add "$SRCROOT/$PROJECT_NAME/[pch file name]" to project settings -> Build Settings -> Apple LLVM 6.0 - Language -> "Prefix Header"
add "YES" to to project settings -> Build Settings -> Apple LLVM 6.0 - Language -> "Precompile Prefix Header"
build the project, then there will be a warning about missing default launch image, just press on the warning and select to add the default, this will add "Default-568h@2x" OR - If you want to use splash images from "Images.xcassets", go to the project settings -> TARGETS -> General -> in "Launch Images Source" choose to use asset catalog, it will create a new one, you can choose then, which to use as asset catalog from the existing. //Override point for customization after application launch. I have the original Empty Application template which was used in Xcode versions prior to Xcode 6. I have uploaded it here. You can either download it and paste it in the Xcode template directory manually or install it using the package manager for Xcode, Alcatraz. Just search for Xcode Empty Application. For Xcode 8 and Swift 3. Just delete the .storyboard file, it will automatically delete the corresponding reference from your .plist and in your AppDelegate.swift add the following code. You can write your own custom ViewCountroller and use in that in AppDelegate.swift as your self.window?.rootViewController, just replace the UIViewController with your own ViewController in the above code. This can simply be deleted. Remove the Main storyboard base file name key. I am using XCode6 Beta & I searched for another solution of this problem by adding Empty template from XCode5.x.x to XCode6 Beta. Paste 'Empty Application.xctemplate' inside Application folder. Now restart XCode6 by quiting & create new project. You will get 'Empty Application' option. First of all you need delete Main.storyboard in Project navigator menu. Than delete row Main storyboard file base name in Info.plist. Yes, Or just use one of the previous Beta to create it, and continue on the latest version after. Not the answer you're looking for? Browse other questions tagged ios xcode storyboard xcode6 or ask your own question. How do I create a new Swift project without using Storyboards? How to set xib file as initialViewController?